Of course, it could never be like those fantasy fifties (1950’s that is) when children rode bikes on red brick Main Streets darting in and out of parked cars where everyone knew them by name. Those were the days when the screen door hit you on the way out and mom never had to worry where you were going. Florida backyards still give children a wonderful place to grow. From swimming pools and jungle gyms to dragonflies and tadpoles, Florida backyards still offer children that opportunity for adventure. Rain or shine, heat or humidity, children gain so much from being outside. The rules are different outside. Children can be louder, messier, bigger and smaller. They can be creator and destroyer. Outside, children begin to imagine how and where they fit in the world. Backyard Beach: Never mind that little preschool sandbox, let’s make that beach theme really work. Carve out a small patch of grass, lay down a sheet of mesh weed-block, and add a little garden border to hold the sand in the designated area. Pour in the sand; add a few beach chairs, umbrella, small tables, and someplace to show off all those great seashells your child has been collecting. Don’t forget the tiki lights because the best beach parties start after dark, at least until the mosquitoes are unbearable. Butterfly Garden: You can’t possibly live in South Florida and not know the beauty of butterfly gardening. 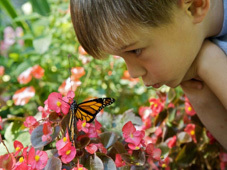 Children especially appreciate the wonders of butterflies and learning about all the plants that the butterflies love. Release your “weekend warrior” and create a butterfly space large or small. You can start with a few potted plants or fill your entire yard. A quick class at Home Depot or Butterfly World will get you started and soon your child will be digging, watering, and weeding to his heart’s content. Wind Chime Garden: If dirt and earthworms are too much, try a wind chime garden where your child can go with a special book or a special friend (real or plush). Clear a small space and fill with stones or mulch. Add some child-size yard furniture. Start with a few small wind chimes and let your child’s musical garden grow little by little. Add a few mosaic stepping stones that you can make with your child on another one of those kid-friendly weekend warrior adventures. Bridge to Nowhere: Children’s literature is filled with quaint and scary bridges to tickle children’s imagination. Is there a spot just right for a small bridge in your garden or on the side of the house. You could have that koi pond you always wanted or you could use an idea from the HGTV website and build a babbling brook with blue aquarium stones. This isn’t just adornment for your yard – it’s a rich, magical place for your child to get lost in imagination. A place to become kings and princesses. A place to talk to wish-granting fishes and frogs. A place for a child to believe. Of course, the possibilities are endless in this age of “design on a dime”. Don’t forget putting greens and outdoor tea rooms, brick pizza ovens and canopy shrouded hammocks. Forget the Italian Grotto for the younger set but consider an “atelier” for your budding artist. Most of all remember how you connected to beautiful spaces when you were a child. Winding paths are always better than straight ones. A special seat to watch a sunset next to your mom and dad is always better than the boring family room sofa. It’s not what you have in your yard that matters. It’s how you use it as a family that matters. May you all find a little magic this summer in your outer spaces. Karen Deerwester is the owner of Family Time Coaching & Consulting, writing and lecturing on parenting and early childhood topics since 1984. Karen is also the Mommy & Me director at The Ruth and Edward Taubman Early Childhood Center at B�nai Torah Congregation in Boca Raton. The content available through the Site is the sole property of Family Time Inc., or its licensors and is protected by copyright, trademark and other intellectual property laws. Except as otherwise explicitly agreed in writing, Family Time Inc.-owned content received through the Site may be downloaded, displayed, reformatted and printed for your personal, non-commercial use only. Get more information on the messy joys of parenting, from toddlers to teens, with Karen, as she answers mom and dad's questions. © 2019 Family Time, Inc.